In this blog post we shall learn how to start a SQL Server Agent from SQL Server Management Studio. First connect to the SQL Instance using SSMS, then inside Object Explorer, collapse the tree view on the SQL Server. 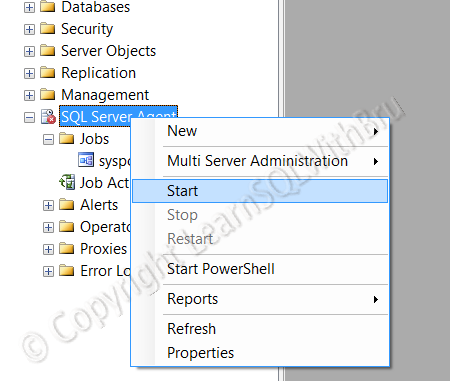 Right click on the SQL Server Agent and from the popup menu item, choose Start. This entry was posted in Learn SQL Server, SQL Server Administration and tagged SQL Agent by Brumedishetty. Bookmark the permalink. that’s nice:) can i ask you about replication into sql? Yes you cans ask anything as long as it is related to SQL Server. Can you be clear on what do you mean replication into sql?..